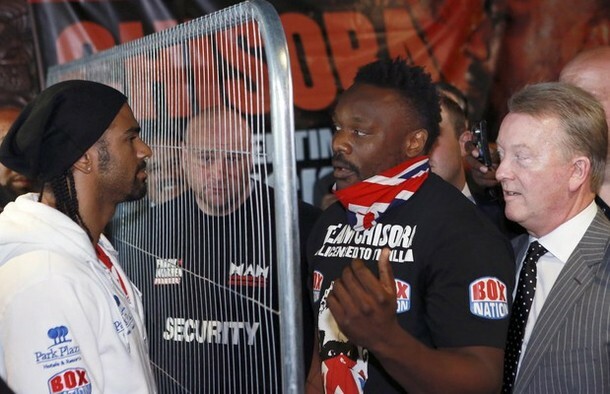 David Haye & Dereck Chisora: Fence Off! David Haye and Dereck Chisora are so up for their fight on Saturday, they had to be separated by a fence during a pre-match press conference. They were so blinded by the hate flowing through their veins, neither realised that they could have simply stepped around the fence and beaten each other to death. Even if we bought into this crap though, and accepted the fact that this is a ploy to promote a ‘grudge’ fight that came about through a rather suspect series of events, we would still have to ask the following question. Are the payday, press coverage and purse attached to all this worth the damage to your careers and reputations?